The grandeur of Lake Tahoe, the largest alpine lake in North America, alongside its vivid blue appearance and exceptionally clear water make it uniquely beautiful. Water clarity in Lake Tahoe is widely seen as a measure of the overall water quality. Continual annual measurement has shown a decline in water clarity over the last few decades, and this long-term decline is of great concern for those who live on the lake, as well as for the millions of visitors who come to the lake each year. A major cause of this over decline is the increased amount of fine sediments and nutrients entering the lake. 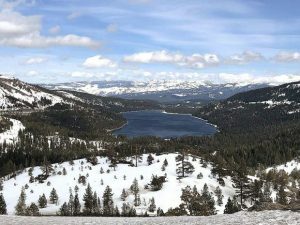 As development of the lands around Lake Tahoe has grown many of its natural water filtration systems, such as wetlands and meadows, have been altered or disturbed. Alongside this disturbance, the impervious surfaces on buildings, roads, and parking lots have created what is essentially a “pollutant pathway” for sediments and nutrients to directly enter the lake. 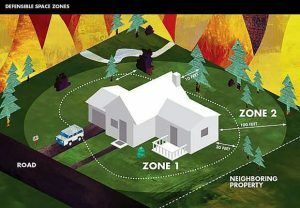 Commonly found in the Tahoe area, unpaved dirt driveways and parking lots are prime examples of surfaces that can quickly erode during large rainstorms and convey the associated pollution into the lake. Because of Lake Tahoe’s clarity and natural beauty, regulations have been developed requiring the treatment of this polluted storm water. Storm water management techniques that capture and treat the polluted water before it enters the lake are effective at protecting the water’s clarity from the runoff of existing development. The system for treating polluted storm water is a framework of strategies referred to as Best Management Practices (BMPs). Roads and other developed property equipped with BMPs function more like natural, undisturbed forest and meadowland by capturing storm water and allowing it to infiltrate through the ground as opposed to being swept into the lake atop compacted surfaces. Paving dirt driveways and installing channel drains with sediment traps and rock-lined bio-swales to capture polluted storm water are extremely effective BMPs. One prominent method of treating the captured polluted water includes burying large structural plastic panels underground to form a void beneath the surface capable of absorbing and filtering the polluted storm water. Alternatively, more economical building techniques are available that do not require large amounts of buried plastic to protect the lake. Utilizing certain green building techniques, native rock and strategic landscape features can effectively protect the lake as well as beautify properties at the same time. Additional effective BMPs include stabilizing steep slopes and loose soil, planting native or adaptive plants in landscaping, re-vegetating and mulching compacted soil, adding drip line treatments, as well as installing parking barriers to prevent future soil disturbance. 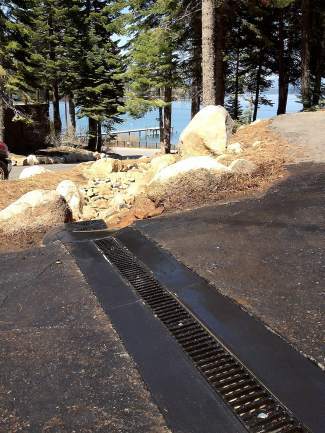 Over the years, since the development of storm-water management regulations, several BMP retrofits have been installed on roadways, commercial, and residential properties within the Tahoe Basin. Gladly, the installation of BMPs around the lake is thought to be having a positive effect on the lake because of recent measurements taken by UC Davis scientists, responsible for monitoring Tahoe’s water, showing that Tahoe’s clarity is the best it has been in 10 years. Charles Snyder is a Green Building Contractor and Environmental Advocate. He can be reached at CSnyder@EfficientBuilds.com or 530-448-2579.